Where do I start this post? I have written it 4 different ways to date. 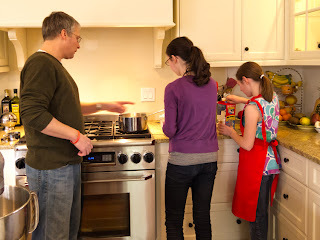 I want this post to be one that I share with you that will really inspire you to get all of the family time you can with your loved ones, because life really can turn on a dime (cliche, but all too true). 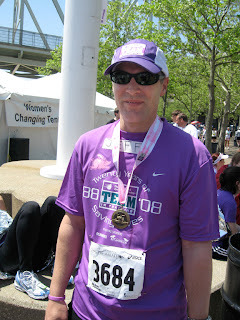 On May 4, 2008 Jeff was sweaty, hot and tired, but he had done what he set out to do. He ran the Cincinnati Flying Pig Marathon to benefit the Leukemia & Lymphoma Society. He felt good that after training so hard he had finished the race and he had raised so much money for this cause. He did not know at the time that within weeks he would soon get devastating news, that he had been diagnosed with a very rare autoimmune disease, Amyloidsis, that would almost take his life. He would be helped in his recovery by the same Leukemia & Lymphoma Society he had just run the race for…..soon he was to be in a race for his life. Jeff has an interesting background. He traveled the world with his parents and actually went to high school in Paris. Eventually he would move back to the states for college and re-connect with a pretty girl that he had known since junior high, Sabrina. They fell in love, got married and promptly moved to France so that Jeff could study at the highly acclaimed La Varenne culinary school. After graduating from this renowned institution, Jeff and Sabrina traveled the globe and Jeff cooked for many celebrities, including Margaret Thatcher. Jeff and Sabrina finally settled down back in the States and had two beautiful, intelligent daughters, Spencer and Matisse. No one ever had to tell Jeff that his family was important. Even with that being said, his illness and recovery has given him a very special insight into just how fragile life is and how everyday is a special blessing to be enjoyed and to be thankful. Jeff’s illness was critical and he underwent extensive treatment including a bone marrow transplant and was in the Mayo Clinic for months, hundreds of miles from his precious family. Thankfully, after so many months the treatment was successful and Jeff was able to return to his family and he has been free from Amyloidsis since that time. When Jeff finally got to return home he arrived with a new sense of purpose and dedication to his family. He could not leave the house for quite awhile because his immunity was low and he was very susceptible to disease. It was almost Christmas….Jeff stayed home and baked for his family for weeks….what did he bake? He baked all of the cookie recipes that his mother had left so lovingly for his family in a handwritten cookbook that she presented to him in her own handwriting. Every day the family came home to freshly baked treats made by dad with love from their grandmother’s recipes. 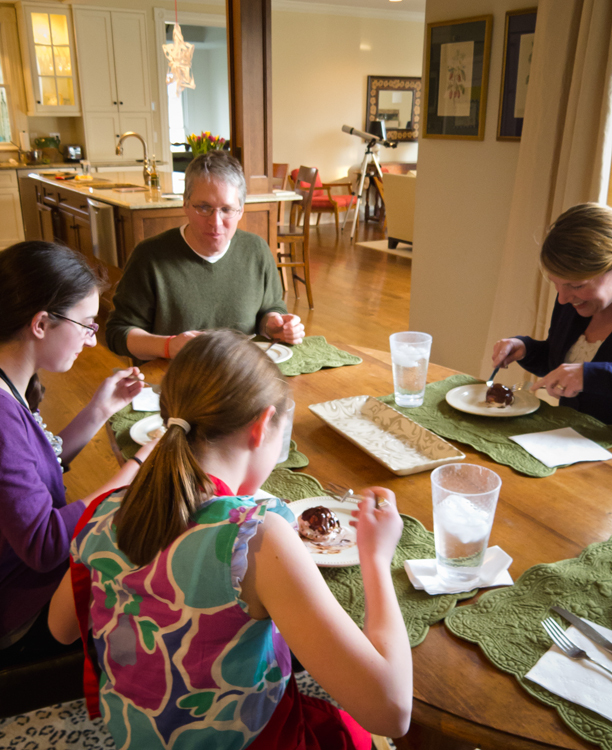 Jeff wanted me to share his very special story with you so that you can see why it is so important to carve out the time to be with your family because we really never know when a chair at the table might soon be empty. You don’t need to say…..woulda, shoulda, coulda….just set the table and enjoy each other right now. A very special thing has happened after I talked to Jeff about doing this story. He has been nominated for “Man of the Year” by the Leukemia & Lymphoma Society. Wow……it really could not have happened to a nicer, more deserving guy. I have volunteered to raise money for his cause, and you can too by making a donation, which in turn becomes a vote for him for “Man of the Year”. Please, if you can,….help to make this possible. Here is the link to his story in his own words and how you can vote for him by contributing to the Leukemia & Lymphoma Society. Oh yes, back to the recipe for this week. Jeff and his girls first baked this for Christmas dessert right after his recovery…..it now is one of their all time favorites….please don’t be afraid to make it….it’s not as complicated as it appears…..2 young girls made it right in front of my eyes (with just a bit of help from dad). Perhaps you might want to make these tasty treats next Sunday for Easter! 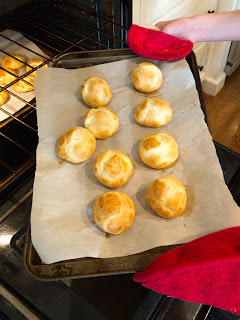 Preheat oven to 350 degrees F. Line 2 cookie sheets with parchment paper or lightly butter and flour the cookie sheets. In a saucepan, place water, milk, butter and salt and bring to a boil and stir making sure that the butter is completely melted. Reduce the heat to low and add 1 cup of flour and cook for 3 minutes mixing rapidly with a wooden spoon. Transfer the mixture into a standing mixer fitted with the paddle attachment and beat for 2 minutes so the mixture can cool. Brush with egg wash (1 egg beaten with 1/4 cup water) and gently press the peaks down so that they do not burn. Bake for approximately 30 minutes till golden brown. Remove from oven and place on cooling rack. Add the 5 eggs, one at a time, mixing well between additions. 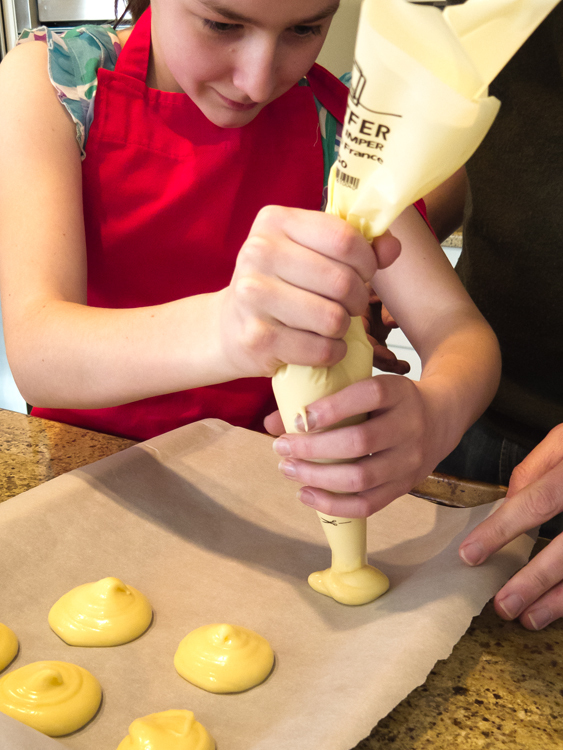 Important: turn off the mixer when adding each additional egg. Beat at fast speed for 1 - 1 1/2 minutes making sure the dough recovers its original texture before the next egg is added. Spoon dough into a pastry bag fitted with a plain tip. Squeeze out golf ball size amounts onto the cookie sheet. Place the finely chopped chocolate into a bowl. In medium saucepan add cream and let it come to a boil. Pour 1/2 cup of cream onto chocolate and stir with a wisk till combined. If the sauce is a bit too thick, add more cream a little at a time till you reach the consistency you desire (we used 3/4 cup of cream when we prepared this sauce). Sauce may be placed back in saucepan or double boiler to keep warm. 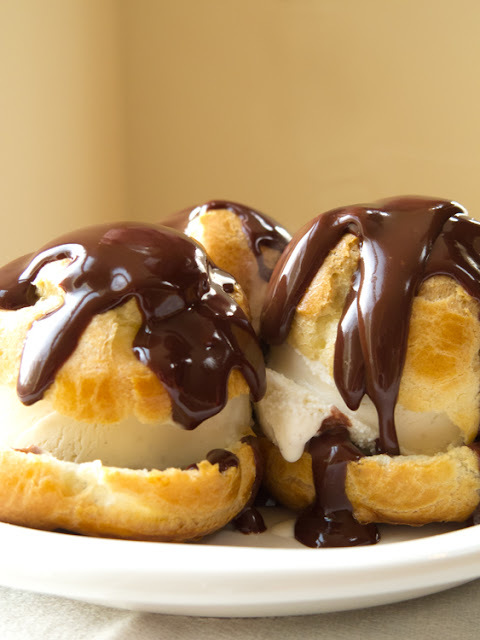 When ready to serve, cut the profiteroles in half, place a scoop of ice cream on the bottom half, cap with top half and spoon on the chocolate sauce. 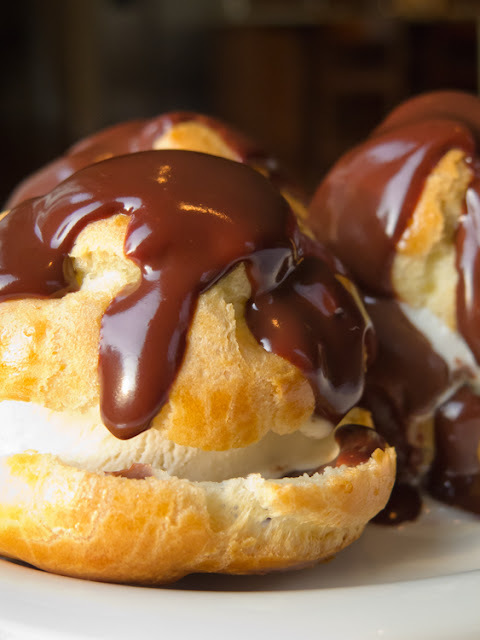 Thank you for the beautiful recipe for profiteroles, I want to make them for Easter, and I was looking for a good recipe…life is precious and we have to really live each moment, try to make it the best! Carpe diem! What a wonderful story and recipe! These look delicious! 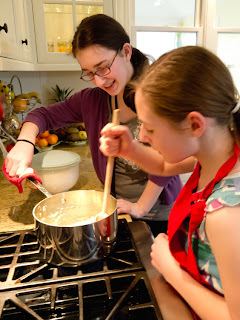 It is a great recipe from one of my personal heroes, thanks for commenting!